This image was made by combining hundreds images taken between August and mid-December by New Horizons' Long Range Reconnaissance Imager (LORRI). It has been colored using deep blue for the darkest regions and yellow for the brightest. Ultima Thule is the bright yellow spot in the middle. The two possible flyby distances for New Horizons are indicated by the two concentric circles. The mission has decided to fly along the closer path, toward the target point marked by an X. Individual images contain many background stars, but by combining images taken at different distances from Ultima Thule, most of the stars can be identified and removed. However, some of them leave behind traces, which can be seen as faint circles radiating away from the target point. Credit: NASA/Johns Hopkins Applied Physics Laboratory/Southwest Research Institute. 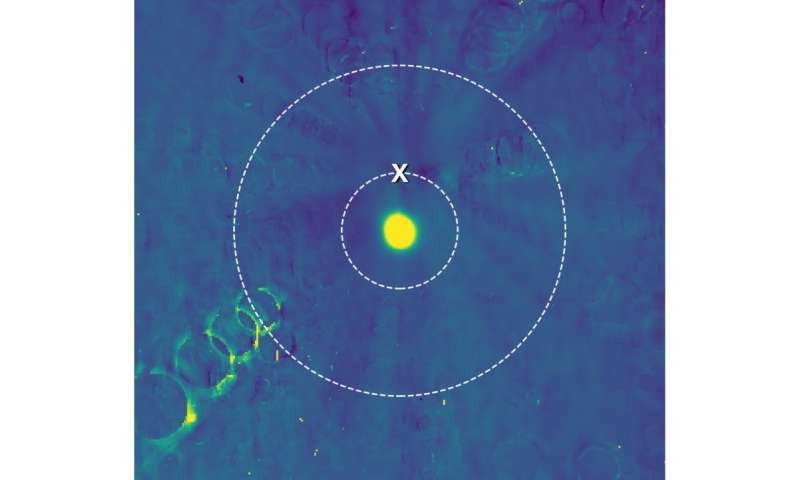 The dozen-member New Horizons hazard watch team had been using the spacecraft's most powerful telescopic camera, the Long Range Reconnaissance Imager (LORRI), to look for potential hazards. The decision on whether to keep New Horizons on its original course or divert to a more distant flyby, which would have produced less-detailed data, had to be made this week since the last opportunity to maneuver the spacecraft onto another trajectory was today (Dec. 18). New Horizons formed its hazard watch team in 2011 to prepare for its Pluto flyby, addressing concerns that Pluto's newly discovered small moons could spread dangerous debris across New Horizons' path. An intense search turned up no potential mission-ending risks; the team opted for the original flight plan and New Horizons safely carried out its historic exploration of the Pluto system in July 2015. "Our team feels like we have been riding along with the spacecraft, as if we were mariners perched on the crow's nest of a ship, looking out for dangers ahead," said hazards team lead Mark Showalter, of the SETI Institute. "The team was in complete consensus that the spacecraft should remain on the closer trajectory, and mission leadership adopted our recommendation." New Horizons will make its historic close approach to Ultima Thule at 12:33 a.m. EST on Jan. 1—the first ever flyby of a Kuiper Belt object.